When most people think of Peter Herdic they think of an industrialist, a wheeler-dealer and entrepreneur who had much with the development of Williamsport as a major economic center. Most people don’t think of him as a transportation innovator. 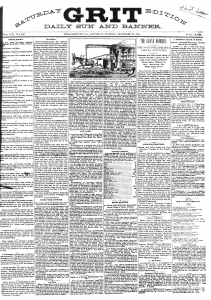 According to an article in the Fall 1973 edition of the Journal of the Lycoming County Historical Society, in 1878 Herdic invented a form of bus or coach that would later be listed in the dictionary under his name. It was similar to a bus of the present day, only smaller. It was horse drawn instead of powered by electricity or gasoline. Many regard it as a predecessor to the taxicab. The method of conveyance developed in Herdic’s fertile mind flourished for a time, not only here in Williamsport but in Philadelphia and Washington, D.C. as well. The first “Herdics” seated a total of eight passengers. They were painted a bright yellow and were soon nicknamed “canaries” because of that color scheme. They used a special axle that Herdic had patented. 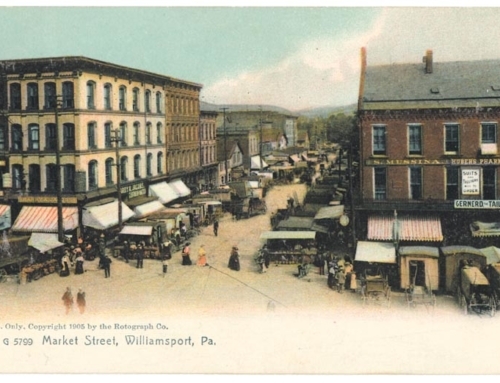 When the “Herdics” or “canaries” were first used there was no streetcar service to Newberry or other streets other than Fourth Street on the east side of Lycoming Creek. The “Herdics” went right to curbside and practically deposited their passengers at their doorsteps, which was an improvement over the previous horse car service. Herdic brought his invention later in 1878, utilizing several hundred at one time but unfortunately, they never acquired much ridership. This was due, in large part, to the introduction of 16-passenger coaches. He also brought his conveyance to Washington, where they were a little more successful. In fact several were still in use up to 1918. Some of the ones used in Washington were pulled by two horses and were able to hold more passengers. The “Herdics” never were a financial bonanza for its inventor and could do nothing to save him from bankruptcies produced by the various financial panics of the era. This does nothing, however, to detract from the unique contribution that Peter Herdic made to mass transit, not only here but in other areas.